Transplantation is a renal replacement therapy in patients with end-stage renal disease (ESRD). Arterial pseudoaneurysm or arterial rupture of the transplanted renal artery is an extremely rare but potentially devastating complication which occurs in fewer than 1% of patients. They may cause functional impairment or death. We describe two patients who underwent renal transplantation from the same deceased multiorgan donor and both developed early vascular complications. A 49-year-old woman with ESRD underwent a cadaveric renal transplant in our department. The kidney was transplanted with an end-to-side anastomosis of the transplant renal artery to the right external iliac artery. Her postoperative condition was uneventful, and the drainage tube was removed on postoperative day 10. However, sudden onset of the right lower abdominal pain occurred 14 days after the operation. Physical examination revealed a distended right lower abdomen without tenderness. There was no significant decrease in the hematocrit. Emergency abdominal computed tomography revealed a large extraperitoneal perinephric renal hematoma. An emergency exploratory laparotomy showed a large number of fresh blood clots and a ruptured graft renal artery; a major 1 cm wide rupture was found at the middle part of the graft artery next to four more tiny leakage points. The arterial rupture was closed primarily with a 5-0 prolene suture, and fibrin sealant (TISSEEL ®, Baxter AG, Vienna, Austria) was applied to strengthen the vascular wall after vessel repair. Culture of the central venous catheter tip showed Candida albicans, and antifungal medication applied. A Doppler ultrasound revealed the graft renal vessels were patent with adequate perfusion of the graft kidney after surgical reconstruction. Renal function gradually recovered with adequate daily urine output 1 month after the operation. However, another episode of septic shock with right lower quadrant abdominal pain occurred 1 month later. An emergency exploratory laparotomy showed massive pus-like fluid around the graft kidney with fungal and bacterial infection confirmed by culture. Necrotic tissue around the graft artery and external iliac artery was observed. A graft nephrectomy was done and the external iliac artery was repaired with a graft patch. The second recipient was a 56-year-old woman with hypertension. The patient had a history of ESRD and had undergone hemodialysis for years. She also received renal transplantation on the same day as Case 1 with similar procedures. She had good graft function and was discharged early. However, decreased urine output and bilateral lower leg edema were noted 32 days after the operation. Compromised renal function was observed. 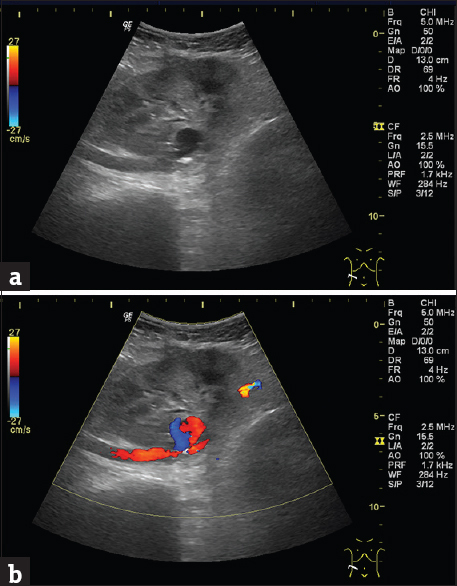 Renal ultrasonography showed a 3 cm hypoechoic mass with a centrally anechoic lesion around the graft renal artery [Figure 1]a. Color-coded Doppler sonography revealed pulsatile flow within the central anechoic part of the lesion [Figure 1]b. The possible diagnosis was a pseudoaneurysm, which partially thrombosed the true lumen of the graft renal artery. Subsequent noncontrast magnetic resonance imaging confirmed a 3 cm × 3 cm false aneurysm near the anastomosis of the transplanted renal artery [Figure 2]. Surgical exploration showed an aneurysmal mass along the anastomosis site near the external iliac artery. Scrupulous dissection isolated the false aneurysm from the transplanted kidney. Vascular control was obtained, and resection of the false aneurysm was then performed. Vascular repair was performed with a primary anastomosis at the external iliac artery and transplanted renal artery using a continuous 5-0 nonabsorbable suture (polypropylene). Fibrin sealant was also applied to the reanastomosis site to prevent vascular leakage. Histopathology of the resected pseudoaneurysm wall showed consistent marked fibrosis and fragmentation of elastic fibers. C. albicans was cultured from the drainage fluid. The patient was continued on immunosuppressive therapy and antifungal medication and was discharged home under stationary condition. Vascular complications are rare in renal transplantation patients but are significant causes of allograft loss. We conducted a comprehensive search to identify all relevant studies of extrarenal vascular pseudoaneurysm or arterial rupture in the MEDLINE (1950 – November 4, 2016) and EMBASE (1970 – November 4, 2016) databases. A total of 45 case reports or case series that met the inclusion criteria were reviewed [Table 1]. According to our literature review, the mortality rate was 13.8%. A major proportion (56.3%) of reported cases lost the graft kidney without mortality. Among the 87 patients, 73 (83.9%) experienced vascular complications at the anastomosis site. The majority of included patients (79.3%) were diagnosed with pseudoaneurysm, and 18 out of 87 patients (20.7%) had an arterial rupture. Only 33 patients (37.9%) had no infective pathogens. C. albicans (24 cases) was the leading pathogen in cases with infection. In our 2 cases, pseudoaneurysm occurred around the anastomosis site, while the ruptured site was at the middle portion of the graft artery in case 1, which is less common arterial than at other sites [Table 1]. Patients with pseudoaneurysms after renal transplant are often asymptomatic and diagnosed incidentally ,. Detecting infective pseudoaneurysm in the early course and starting immediate surgical treatment with antifungal medications are essential. Candida arteritis-related pseudoaneurysm or ruptures may progress rapidly in the early stage after transplantation ,,,. This finding is different from that of those with chronic rejection-related transplant arterial pseudoaneurysm, which may be associated with a delayed course and relatively slow progression. One report suggested that 2-week preemptive prophylaxis with antifungal agents can effectively prevent delayed vascular complications in patients with donation-after-cardiac-death kidney transplantation complicated by fungal infection-related hemorrhage. Elimination of C. albicans is required to prevent possible arterial complications. Surgical repair to preserve a transplanted kidney is not usually successful in vascular complications. We applied fibrin sealant for anastomosis, which seemed sufficient for control after surgical suturing for realignment of the vascular wall. No evident leakage was observed through daily drainage monitoring in both case 1 and case 2. This study is also the first to report successful use of fibrin sealant in securing injured transplant vessels. The development of an extrarenal pseudoaneurysm or arterial rupture in a transplant renal artery is extremely rare. It can cause a potentially devastating allograft loss and may require allograft nephrectomy. For those with suspected vascular complications, early clinical diagnosis and aggressive surgical intervention are necessary to achieve better allograft outcome and patient survival. The authors certify that all patients have obtained appropriate patient consent forms. In the form, the patients have given their consent for their images and other clinical information to be reported in the journal. The patients understand that their names will not be published and due efforts will be made to conceal their identity, but anonymity cannot be guaranteed. Dimitroulis D, Bokos J, Zavos G, Nikiteas N, Karidis NP, Katsaronis P,et al. Vascular complications in renal transplantation: A single-center experience in 1367 renal transplantations and review of the literature. Transplant Proc 2009;41:1609-14. Kyriakides GK, Simmons RL, Najarian JS. Mycotic aneurysms in transplant patients. Arch Surg 1976;111:472-6. Renigers SA, Spigos DG. Pseudoaneurysm of the arterial anastomosis in a renal transplant. AJR Am J Roentgenol 1978;131:525-6. Benoit G, Icard P, Lebaleur A, Charpentier B, Jardin A, Friesg D. Mycotic aneurysm and renal transplantation. Urology 1988;31:63-5. Koo CK, Rodger S, Baxter GM. Extra-renal pseudoaneurysm: An uncommon complication following renal transplantation. Clin Radiol 1999;54:755-8. Battaglia M, Ditonno P, Fiore T, De Ceglie G, Regina G, Selvaggi FP,et al. True mycotic arteritis by Candida albicans in 2 kidney transplant recipients from the same donor. J Urol 2000;163:1236-7. Reus M, Morales D, Vázquez V, Llorente S, Alonso J. Ultrasound-guided percutaneous thrombin injection for treatment of extrarenal pseudoaneurysm after renal transplantation. Transplantation 2002;74:882-4. Garrido J, Lerma JL, Heras M, Labrador PJ, García P, Bondía A,et al. Pseudoaneurysm of the iliac artery secondary to Aspergillus infection in two recipients of kidney transplants from the same donor. Am J Kidney Dis 2003;41:488-92. Peel RK, Patel J, Woodrow G. Iliac artery false aneurysm following renal allograft: Presentation with non-specific inflammatory response and treatment by endovascular stent graft. Nephrol Dial Transplant 2003;18:1939-40. Taghavi M, Shojaee Fard A, Mehrsai R, Shadman M. Late onset anastomotic pseudoaneurysm of renal allograft artery: Case report, diagnosis, and treatment. Transplant Proc 2005;37:4297-9. Laouad I, Buchler M, Noel C, Sadek T, Maazouz H, Westeel PF,et al. Renal artery aneurysm secondary to Candida albicans in four kidney allograft recipients. Transplant Proc 2005;37:2834-6. Zavos G, Pappas P, Kakisis JD, Leonardou P, Manoli E, Bokos J,et al. Endovascular repair as first-choice treatment of iliac pseudoaneurysms following renal transplantation. Transplant Proc 2005;37:4300-2. Fujikata S, Tanji N, Iseda T, Ohoka H, Yokoyama M. Mycotic aneurysm of the renal transplant artery. Int J Urol 2006;13:820-3. Fujita S, Fujikawa T, Mekeel KL, Foley DP, Kim RD, Howard RJ,et al. Successful endovascular treatment of a leaking pseudoaneurysm without graft loss after simultaneous pancreas and kidney transplantation. Transplantation 2006;82:717-8. Nguan CY, Luke PP. Renal artery pseudoaneurysm of infectious etiology: A life-threatening complication after renal transplantation. Urology 2006;68:668-9. Siu YP, Tong MK, Leung KT, Kwan TH, Au TC, Cheung YK,et al. Renal artery pseudoaneurysm following renal transplantation and treatment by percutaneous thrombin injection. Hong Kong Med J 2006;12:80-1. Fornaro J, Marincek B, Jungius KP. 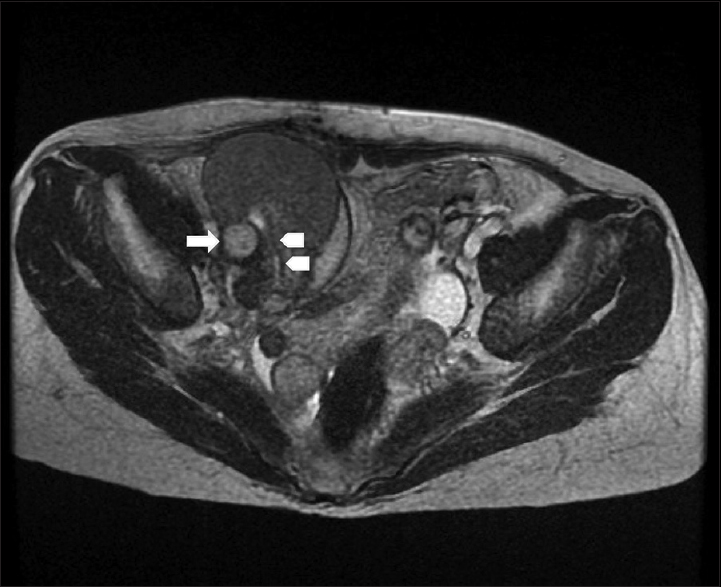 Pseudoaneurysm in the iliac fossa after renal transplantation – treatment with ultrasound-guided thrombin injection. Abdom Imaging 2007;32:50-2. Poels JA, Riley PL. Extrarenal transplant artery pseudoaneurysm: A combined therapeutic approach. Cardiovasc Intervent Radiol 2008;31:404-6. Gravante G, Pisani F, D'Angelo M, Iaria G, Orlando G. Renal artery aneurysms in kidney grafts. Am J Surg 2008;196:e46-7. Orlić P, Vukas D, Curuvija D, Markić D, Merlak-Prodan Z, Maleta I,et al. Pseudoaneurysm after renal transplantation. Acta Med Croatica 2008;62(Suppl 1):86-9. Bracale UM, Carbone F, del Guercio L, Viola D, D'Armiento FP, Maurea S,et al. External iliac artery pseudoaneurysm complicating renal transplantation. Interact Cardiovasc Thorac Surg 2009;8:654-60. Bracale UM, Santangelo M, Carbone F, Del Guercio L, Maurea S, Porcellini M,et al. Anastomotic pseudoaneurysm complicating renal transplantation: Treatment options. Eur J Vasc Endovasc Surg 2010;39:565-8. Liu KY, Tsai PJ, King KL, Chen TH, Shyr YM, Su CH,et al. Pseudoaneurysm of the iliac artery secondary to Aspergillus infection after kidney transplantation. J Chin Med Assoc 2009;72:654-6. Orlando G, Di Cocco P, Gravante G, D'Angelo M, Famulari A, Pisani F,et al. Fatal hemorrhage in two renal graft recipients with multi-drug resistant Pseudomonas aeruginosa infection. Transpl Infect Dis 2009;11:442-7. Osmán I, Barrero R, León E, Medina R, Torrubia F. Mycotic pseudoaneurysm following a kidney transplant: A case report and review of the literature. Pediatr Transplant 2009;13:615-9. Sharron JA, Esterl RM, Washburn WK, Abrahamian GA. Surgical treatment of an extrarenal pseudoaneurysm after kidney transplantation. Vasc Endovascular Surg 2009;43:317-21. Wang R, Wu J, Wang Y, Huang H, He Q, Chen J,et al. Aspergillus infection limited to the anastomosed artery following renal transplantation: A report of 4 cases. Transpl Infect Dis 2009;11:363-6. Al-Wahaibi KN, Aquil S, Al-Sukaiti R, Al-Riyami D, Al-Busaidi Q. Transplant renal artery false aneurysm: Case report and literature review. Oman Med J 2010;25:306-10. Akgul E, Binokay F, Aikimbaev K, Aksungur EH. Extrarenal pseudoaneurysm of the arterial anastomosis in a renal transplant: Endovascular coil embolization with balloon remodeling technique. Ren Fail 2011;33:452-5. Lee CH, Kao YC, Chan WP. Pseudoaneurysm with candidal infection after renal transplantation. Intern Med 2011;50:2679-80. Minz M, Sharma A, Kumar S, Singh S, Shivaprakash MR, Bag S,et al. Use of autogenous internal iliac artery for bridging the external iliac artery after excision of Aspergillus mycotic aneurysm in renal transplant recipients. J Vasc Surg 2011;53:802-4. Buimer MG, van Hamersvelt HW, Adam van der Vliet J. Anastomotic pseudoaneurysm after renal transplantation; a new hybrid approach with graft salvage. Transpl Int 2012;25:e86-8. Favelier S, Kretz B, Tanter Y, Loffroy R. Stent-assisted detachable coil embolization of a late-onset wide-necked anastomotic renal allograft artery pseudoaneurysm. 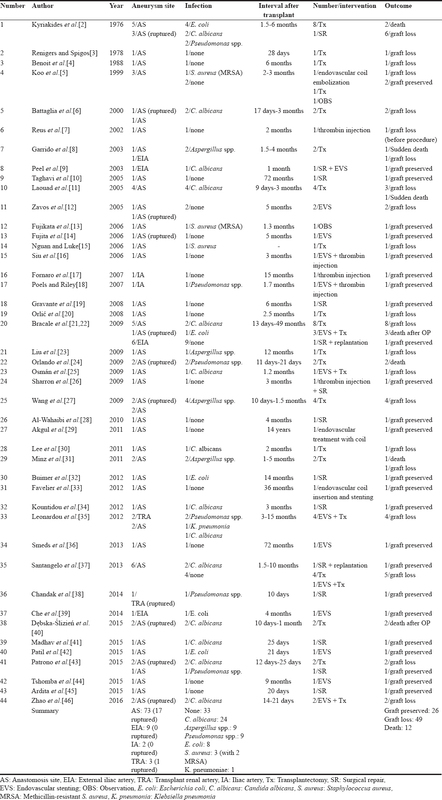 J Vasc Surg 2012;56:1131. Kountidou CS, Stier K, Niehues SM, Lingnau A, Schostak M, Fuller TF,et al. Successful repair of post-transplant mycotic aneurysm of iliac artery with renal graft preservation: A case report. Urology 2012;80:1151-3. Leonardou P, Gioldasi S, Zavos G, Pappas P. Mycotic pseudoaneurysms complicating renal transplantation: A case series and review of literature. J Med Case Rep 2012;6:59. Smeds MR, Ofstein R, Peterson GJ, Peterson BG, Jacobs DL. Endovascular repair of a para-anastomotic pseudoaneurysm after renal autotransplantation: An alternative to open reconstruction. Ann Vasc Surg 2013;27:110.e5-8. Santangelo ML, Bracale UM, Carlomagno N, De Rosa D, Spiezia S, Scotti A,et al. Kidney transplantation and large anastomotic pseudoaneurysm. Transplant management considerations. Ann Ital Chir 2013;84:275-9. Chandak P, Kessaris N, Uwechue RU, Abboudi H, Hossain M, Harris F,et al. Successful excision of a suspected mycotic transplant renal artery patch aneurysm with renal allograft autotransplantation. Transplantation 2014;97:e25-6. Che H, Men C, Yang M, Zhang J, Chen P, Yong J,et al. Endovascular repair of a transplant renal artery anastomotic pseudoaneurysm using the snorkel technique. J Vasc Surg 2014;60:1052-5. Dębska-Ślizień A, Chrobak Ł, Bzoma B, Perkowska A, Zadrożny D, Chamienia A,et al. Candida arteritis in kidney transplant recipients: Case report and review of the literature. Transpl Infect Dis 2015;17:449-55. Madhav D, Kumar P, Mohan C, Vijay, Mahesh U, Anusha.et al. Candida-associated pseudo-aneurysm of the transplant renal artery presenting as malignant hypertension and managed successfully without nephrectomy. Saudi J Kidney Dis Transpl 2015;26:1000-5. Patil VV, Roytman M, Ames S, Beckerman W, Lookstein RA. Endovascular repair of renal artery anastomotic pseudoaneurysm following living donor kidney transplant. Cardiovasc Intervent Radiol 2015;38:1640-4. Patrono D, Verhelst R, Buemi A, Darius T, Godefroid N, Mourad M,et al. Presentation and management of mycotic pseudoaneurysm after kidney transplantation. Transpl Infect Dis 2015;17:129-36. Tshomba Y, Apruzzi L, Kahlberg A, Baccellieri D, Vitale R, Chiesa R,et al. Endovascular repair of delayed giant iliac pseudoaneurysm following simultaneous pancreas-kidney transplantation with preserved allografts function. J Cardiovasc Surg (Torino). 2015. pii: R37Y9999N00A150083. Ardita V, Veroux M, Zerbo D, D'Arrigo G, Caglià P, Veroux P,et al. Non-mycotic anastomotic pseudoaneurysm of renal allograft artery. Case report. Ann Ital Chir 2016;87. pii: S2239253X16025081. Zhao DD, Huang ZY, Hong LQ, Liao T, Tang YE, Na N,et al. Massive hemorrhage caused by fungal infections after donation-after-cardiac-death kidney transplantation: Clinical features, prevention and treatment experience. Zhonghua Yi Xue Za Zhi 2016;96:1570-2.